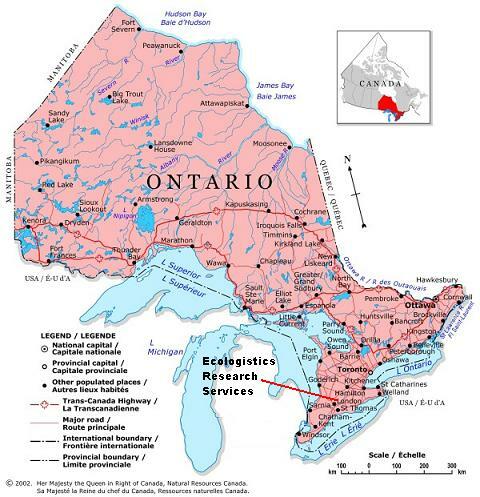 Ecologistics Research Services is located in zone 5, in southwestern Ontario, Canada. Our facility is located east of London and west of Toronto, just north of highway 401. We are within driving distance of the border crossing at Windsor, as well as two international airports, London and Toronto. A simplified map of our immediate area is shown below. For additional site information and travel directions, please see MapQuest or Yahoo Maps. Please feel free to contact us at bkerr@ecologistics.com or call 519-461-1167.